When Peggy joined our team in 2017, she brought with her years of orthodontic and general dental assisting experience. And she was hardly new to our practice. 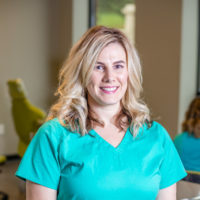 She had experienced Hermanson Orthodontics from the patient’s perspective while in high school, then completed a clinical rotation with our practice while earning her dental assisting certificate from MCC. We are thrilled to now have her as a member of our team. In addition to her clinical assisting duties, Peggy makes sure that we never run out of anything—from orthodontic wires to toilet paper. Peggy grew up in Tama and now lives in Bondurant with her husband Jeff and their two kids, Brady and Brynn. Peggy enjoys getting to know her patients and showing off her signature Hermanson Orthodontics smile! ?